A word of warning... this reviewer has liked a surprising number of movies featuring killer sea life. I’m not one for water sports and the fact that I enjoy them so much almost defies explanation. They’re often over-the-top and don’t always make a whole lot of, well, sense. Relatively recent efforts like 1998’s Deep Rising, 1999’s Deep Blue Sea and 2010’s Piranha 3D aren’t award-worthy classics, but they all provide a steady supply of goofy, monster-movie fun. The very same can be said of The Meg and, well, I liked it too. Jonas Taylor (Jason Statham) is an underwater rescue operative who vows never to return to the sea after being blamed for a tragic event on the job. Thankfully, his retirement is short-lived after an incident in the South Pacific at an undersea research facility funded by billionaire Jack Morris (Rainn Wilson). A submersible craft piloted by Taylor’s ex-wife (Jessica McNamee) is attacked by a Megalodon in a trench at the lowest depths of the ocean... beneath a sulfur cloud that has been separating ancient aquatic lifeforms from the known waters. The revelation vindicates Taylor’s claims of a monster, but puts everyone on the shark’s menu after it follows the survivors up through the cloud to their base. The shark may be the biggest scenery chewer, but some of the cast are just as exaggerated. This epic silliness coincidentally puts Taylor near the doctor (Robert Taylor) who reported the hero as being cowardly on his previous mission. Team member Suyin (Bingbing Li) is determined to impress her father Dr. Mingway Zhang (Winston Chao), which ultimately leads to an overly heartfelt declaration about how proud he is of her. And there’s goofiness as the “brilliant” team throw around not-so-great ideas on how to stop the menace. This includes hopping in a shark cage after the designer insists that it can handle any kind of pressure. That may be true, but pretty much anyone watching will wonder why no one asked about the line holding the cage to the boat. Ultimately, logic doesn’t matter. The cast are all likable enough and their knowing looks and offhanded comments are clear winks at the audience. Everyone involved seems to know just how ridiculous all of this is and appear to be having as much fun as they can. Several conversations between the stars supply laughs as they express great concern or disturbance at what they’re being asked to do - and most of the time, what transpires is just as embellished as imagined. Even the reemergence of one figure at the end of the film results in an amusingly baffled and confused reaction from the lead. The action scenes are fun and the movie makes frequent use of characters slowly fleeing, diving and turning away at the last possible moment from the shark as it veers towards them. Even the computer generated animal has a seemingly sinister grin, almost as if it’s in on the joke. And there’s plenty of strangely humorous bloodshed as the Megalodon chows down on beachgoers playing in the water on a comically wide variety of floating apparatuses. Who knows why I enjoy these kinds of pictures? Perhaps there’s something mysterious about the world beneath the surface that adds a layer of tension to the proceedings. Or maybe it’s also because the filmmakers involved knew not to take themselves seriously. 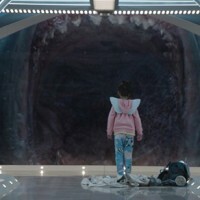 In the end, The Meg may be one of the most expensive B-movies ever made, but one can’t help but smile during several of the film’s absurd, shark-related set pieces. It will never be mistaken for a cinematic masterpiece, but this flick meets all of its intended goals and ends up providing plenty of goofy undersea adventure for thrill seekers.